It’s a very oddly structured novel. The whole thing centers around these four sisters attempts to get their spinsterish third sister, Yukiko, married off. They continually come close to arranging a marriage, only to have something go wrong at the last minute. In the meantime, the fourth sister, Taeko, becomes more independent and willful. All the portraits are very nuanced, though. There’s a tendency to see Yukiko as something of a sap and Taek as an enlightened, modern woman. But that’s not quite right. Yukiko doesn’t want to marry someone that she doesn’t want to marry, and she’s fully willing to bear the consequences of that–she’s okay with being a spinster. And Taeko wants to get her own way, but she often comes off as somewhat selfish. I think part of the lesson of the novel is that there is no way to break with societal mores without coming off as a selfish person, because it is fundamentally pretty selfish to care more about what you want than about what other people think. In modern America, we try to ignore that, by appealing to some universal human right to self-determination. When someone in an American novel chooses freedom, they’re really doing everyone else a favor, by creating a world where it is more possible to be free. But…that’s not really why they’re doing it. They’re doing it because that’s what they want to do. Like, in America, it’s an accepted point of fact that if you’re unhappy and trapped in a loveless marriage, then you should leave. And I agree. You should leave. But we’re very uncomfortable with the implications of this belief, which is that a person should prioritize their own happiness over the happiness of their spouse and their children. We’re so uncomfortable with it, in fact, that we often pretend like this isn’t the real choice: we pretend that unhappy marriages lead to unhappy children. I’m not sure that’s the case, though. Look at all the situations in which people divorce after their kids have gone to college: they were obviously only staying together for the sake of the children. And yet…it often seems less traumatic for the kids than if their parents had divorced during their childhood. And, on a purely financial level, it’s certainly much harder to care for and provide for the children when you have two single parents. Which is not to say that I find anything unethical about divorce or about refusing (as Taeko does) to break off relations with men that your family matriarchs don’t approve of. And neither does The Makioka Sisters. It’s just that the novel is honest enough to take an honest look at the selfishness that human beings need to have if they’re going to lead honest lives. The novel was an interesting one. While reading it, I wasn’t sure if I was enjoying it. But I can tell that it’s one that’s going to stay with me for awhile. I usually claim that I only read books that I enjoy, but this both true and untrue. What’s true is that there’s a minimum level of enjoyment that I need to be getting from a book if I’m going to read it. But what’s untrue about it is that sometimes the books that give me the most white-hot pleasure are not the ones that I am happiest to have read. 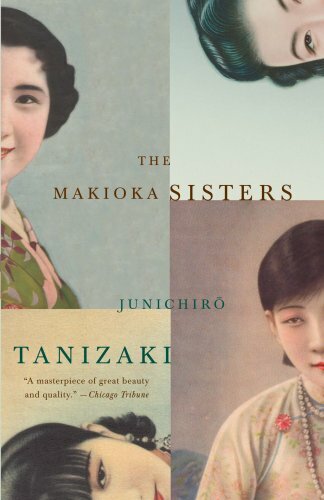 I’ve rarely had a reading experience that was as purely pleasurable as Lev Grossman’s The Magicians, but I do not think that book added as much to my life as The Makioka Sisters did.